USA Network Amanda Warren, left, and AzMarie Livingston star in the “The Purge,” premiering Tuesday. Several times, successful horror-movie franchises have translated their scares into television series. 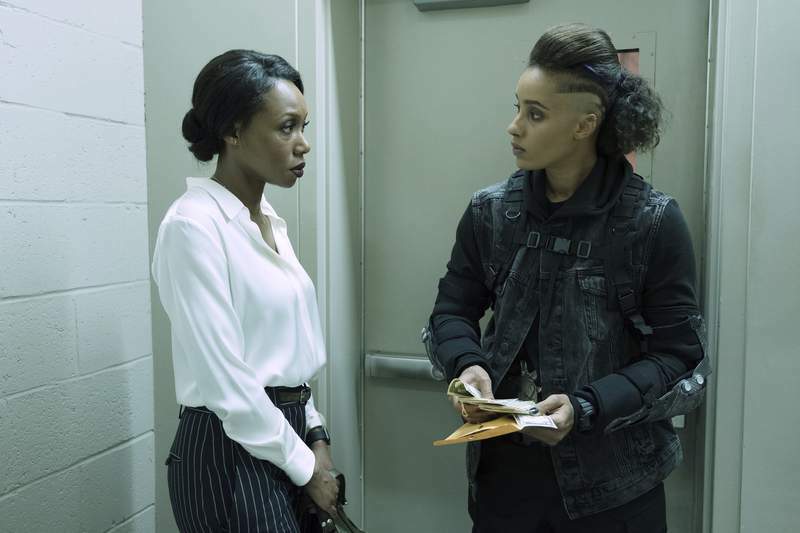 The latest example comes close on the heels of another theatrical triumph financially, as USA Network premieres its version of “The Purge” on Tuesday. As with the movies – including the very recent “The First Purge,” which made nearly 10 times its production budget – the new show, overseen by the same producers, concerns a 12-hour span allowing crimes that extend to murder. For TV, “The Purge” focuses on a small American town where supposedly disconnected characters face perils and plot their survival as the politically approved free-for-all unfolds. Pivotal to the action is a Marine (played by Gabriel Chavarria) who returns home, on what happens to be the night of the Purge, after receiving a troubling message from his sister (Jessica Garza). The ensemble cast also includes Lili Simmons (“Westworld”), Lee Tergesen (“Oz”), Amanda Warren (“Three Billboards Outside Ebbing, Missouri”), Colin Woodell and Hannah Emily Anderson (“Jigsaw”), with William Baldwin and Fiona Dourif (“True Blood”) in recurring roles. “The Purge” comes from Jason Blum, a producer whose Blumhouse firm is noted for turning out modestly financed films (often horror tales) that have performed powerfully in ticket sales. That surely was the case with Blum's original “Purge” in 2013, as Ethan Hawke played the head of a family that ended up opposing a violent gang. Made for $3 million, “The Purge” grossed nearly $90 million worldwide ... and that's math you don't really have to do in determining whether to make a sequel. “The Purge: Anarchy” followed in 2014 and again was an international hit, returning more than 11 times its budget. In 2016, “The Purge: Election Year” did it again, making more than $118 million against a cost of $10 million – not only paving the way for “The First Purge” but, in essence, also for the TV series. To consider how the home screen has done with such attempts previously, some recognizable titles offer evidence. After several rounds about masked, murderous Jason Voorhees and his usually young victims, the “Friday the 13th” movies lent their title to a syndicated 1987-1990 series about antique-shop owners pursuing cursed artifacts to keep them safely stored. “The Purge” is on again, then, and the world soon will know how well home viewers withstand it.